Here I am, on a beautiful October day (it also happens to be world ballet day). Fall has already started and with it comes the return of the much infamous pumpkin spice latte. Being Mexican, I wouldn’t consider pumpkin as something you would eat, let alone drink. The idea of a dessert made out of a vegetable doesn’t really appeal to me. I clearly remember the first time I was offered a slice of pumpkin pie. It happened on my first (and only) American Thanksgiving day. I’d never heard of it before and I was a bit scared to try it. I was worried that I wouldn’t like it and knew that it would be rude not to finish it. I politely declined, thinking to myself how wrong it seemed to have a pumpkin flavoured dessert. It wasn’t until I moved to Canada that I finally tried pumpkin pie. I still don’t find it very appealing, however, one must always be thankful for the food on one’s plate, yes? So, Pumpkin Spice Latte, what’s the big deal? It’s pretty obvious that the big mermaid company has turned this drink into the default fall beverage. Their sales skyrocket as soon as it makes its annual reappearance on the menu. The PSL (as the cool kids like to call it) is among the five best-selling beverages on the Starbucks menu. The first question I have to ask is: do people really like Pumpkin Spice Latte? What is it that makes this beverage such a success? Well, for this post, I asked people this exact question. Conveniently for me, the “Poll” feature has just been added to Instagram stories. This made my search for the truth a little easier. What I discovered was that opinions were divided 50/50. So I was back to where I started. Most people say the main reason they like the drink is its cinnamon-y, pepper-y taste. The smell and flavour of the drink reminds people of autumn, thanksgiving and Christmas in the near future. It has less to do with the pumpkin than the nutmeg, ginger and other secret holiday spice blends that they throw in there. Others said that they liked the idea of a seasonal drink more than the taste of said drink. Pumpkin Spice Latte is what the cool kids do in the fall and people are keen not to be left out of this tradition. Those opposed to the PSL trend question whether there is even real pumpkin in the drink and note that it is too sweet to be able to taste anything besides sugar. After hearing various opinions, I was finally brave enough to go and buy one for myself (also I needed to have an opinion of my own before I wrote this post). I went to my nearest Starbucks and ordered an almond milk Pumpkin Spice Latte to-go (do they even do stay-in coffees any more?). I was asked if I would like some PSL flavoured whipped cream to go on top of that but declined. My first thought was “ Wow, it does smell like fall”. But as soon as I tasted it I discovered that, like people told me, it was way to sugary to even taste the pumpkin. I might as well have ordered a Caramel Macchiato. I’m a slow drinker and as the latte cooled down I was able to taste a little bit more of its pumpkin-y-ness. It was such a light flavour that I could’ve easily mistaken it for orange flavour. Orange Spice Latte sounds pretty yummy though. I wonder if any local coffee shop already has it? I was, as suspected, a bit disappointed by the drink. There’s a reason I haven’t been to the green mermaid coffee chain in almost two years. I proceeded to “Plan B”: Find a Pumpkin Spice Latte I actually like. Like every other millennial, I began my extensive PSL research on Pinterest. After experimenting with a few recipes I came up with my own variation. 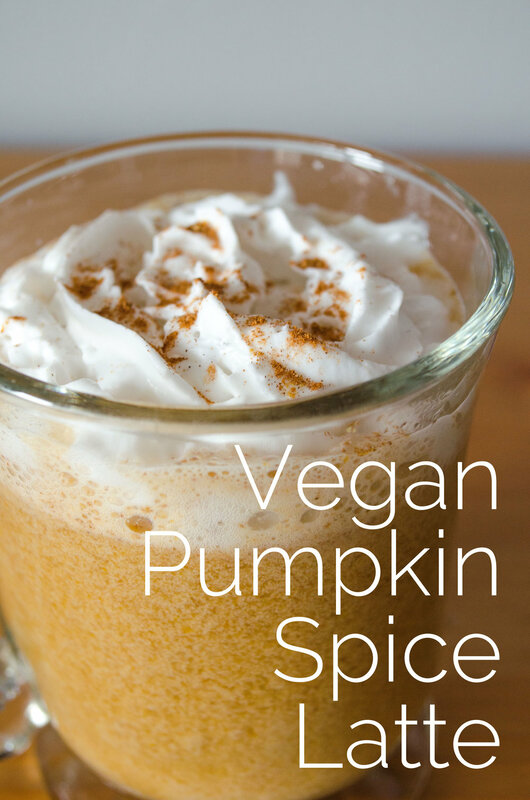 So, without further ado, I present to you my very own Vegan Pumpkin Spice Latte recipe. I hope you enjoy it as much as I do! Everyone's fall favourite drink. Made from scratch with 100% natural ingredients. Perfect for a crisp holiday morning. 1. Make the Pumpkin Spice. Mix: 1 1/2 tbsp of cinnamon, 2 teaspoons of ginger, 1/2 teaspoon of nutmeg and a pinch of cloves (or all spice).2. Over high heat. Mix the milk, pumpkin pureé and maple syrup. Whisk and reduce to medium heat when boiling.3. Add half a teaspoon of the pumpkin spice and the coffee. Bring to boil (or your preferred temperature really) 4. Serve and add the whipped cream on top. Garnish with pumpkin spice.